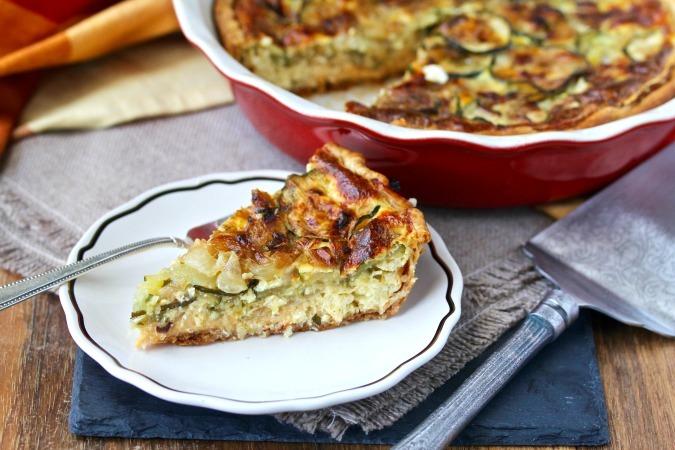 Quiche is a wonderful vehicle for all kinds summer vegetables. As long as you par cook the vegetables to cook off some of the moisture before adding them to the egg and cheese mixture, you can add just about all of your favorite vegetables into a quiche. The other great thing about quiche is that is can be served warm or at room temperature, making it a great make-ahead dish for a summer brunch or a picnic. In addition, leftovers can easily be reheated. One of the most abundant veggies of summer is zucchini (I know, I know, zucchini is technically a fruit). There is even a "holiday," National Sneak Some Zucchini onto Your Neighbor's Porch Day (August 8) to honor the prolific backyard farmers who produce it every year. In fact, my cousin gifted me with zucchini, crookneck squash, pattypan squash, and lots and lots of delicious onions from her garden. I made this Air Fryer Summer Vegetable Tart, this cheesy Zucchini Sandwich Bread, a delicious zucchini and crookneck squash pasta and sausage dish, and an incredible roasted onion dip with most of the haul. Some of the red onions ended up in this Mexican Street Corn Salad and this Greek-Style Watermelon and Tomato Salad. Every single recipe was delicious. P.S. I am in love with my new Emile Henry Pie Dish. I bought it after America's Test Kitchen rated it "highly recommended," and I've been super happy with it. 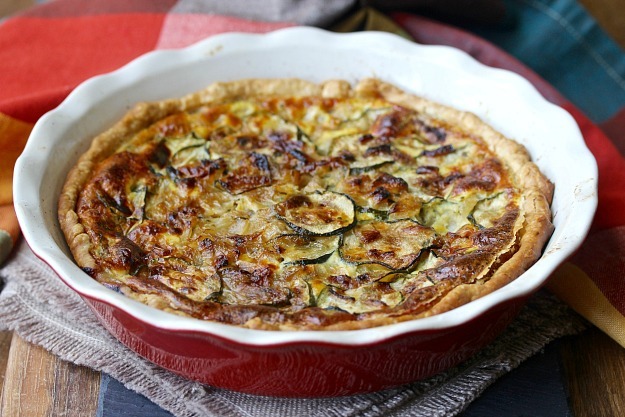 You can also bake this quiche in a tart pan or a Pyrex pie pan. Note: Some of the product links contained in this post are Amazon affiliate links. This means I earn a small commission in store credit to support my out of control cookbook habit if you purchase a product I referred (at no extra charge to you). This week is #FarmersMarketWeek, hosted by Ellen and Christy. 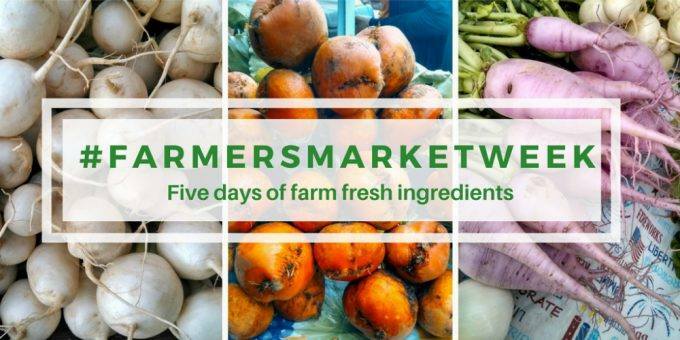 After the recipe, be sure to check out the rest of the Farmer's Market Week recipes featuring fresh from the farm ingredients. Preheat the oven to 400 degrees F with a rack in the lower middle position. Roll out your pie crust dough into a 12 inch round and place it in a 9 inch pie plate or tart/quiche pan and flute the edges. Place it in the refrigerator while preparing your filling. Melt the butter in a 10 to 12 inch skillet over medium low heat. Add the onion, basil, oregano, and salt and pepper. Sauté for 3 to 4 minutes, until the onion is soft and translucent. Add the zucchini and cook for another 2 to 3 minutes, until the zucchini slices have softened. Set aside. Remove the pie crust from the refrigerator and sprinkle the cheese evenly over the pastry. In a small bowl or 2 cup measuring cup, whisk together the eggs and milk. Set aside. Spread the sautéed vegetables evenly over the cheese and then pour the egg and milk mixture over the vegetables. Bake the quiche for 30 to 45 minutes, until a thin knife inserted in the center comes out clean. If the crust begins to get too brown before the filling is done, shield the edges with foil or a pie shield for the last few minutes of baking. Let the quiche rest for 10 minutes before serving. I love quiche...they are perfect any time of the day...breakfast, lunch, dinner a snack...whenever you get a hankering. Mmm! Like Wendy, I love how versatile quiche is. 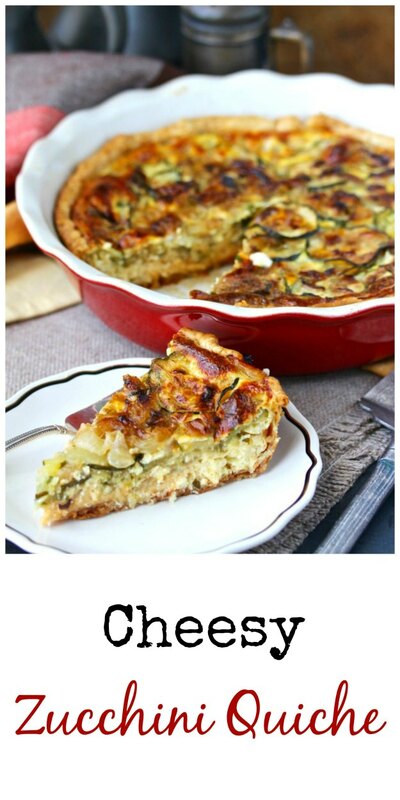 I love zucchini and eggs together too, so this looks like a great meal to me! I love any kind of quiche for breakfast! This one sounds lovely. Perfect for all that extra zucchini! what great color you got on that bake! I'm in love this one! It just looks too good to resist!!! 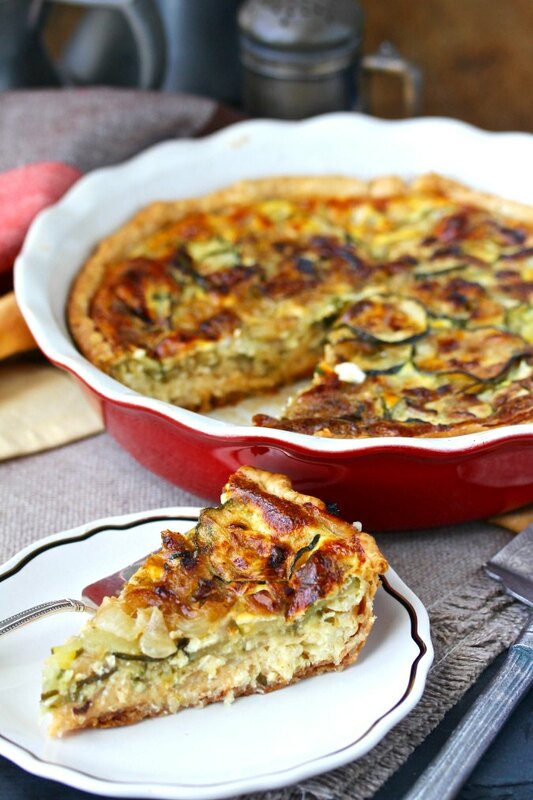 I can never have enough zucchini recipes, this looks so good! They are my most searched recipes on this blog! For whatever reason I haven't made quiche in a little while but this is making me think I really should make one again soon. Looks great! Thank you Caroline. I forget about quiches too, and they are so easy! I would love this cheesy quiche any time of day! I love that it's so versatile! I'm so excited to try this! It looks amazing! This is such a lovely brunch dish - for all year round! Thank you! I would agree. Yum! Another great way to use up that zucchini! I love a good quiche, and this sounds fabulous! Yum! I haven't made a quiche in forever and this looks sooooo good! It's one of those dishes that we forget about, isn't it? I love quiche. We should make it more often. It's so easy and delicious. And this one looks gorgeous! Thank you. I forget about making it too! I think I need a slice of this!